Lobster mini season is right around the corner, so it’s about time you get ready. Here in Florida, we have a mini season (this year it’s on July 26 & 27, 2017) and a regular season to harvest spiny lobsters (starts on Aug 6 and goes until March 31, 2018). 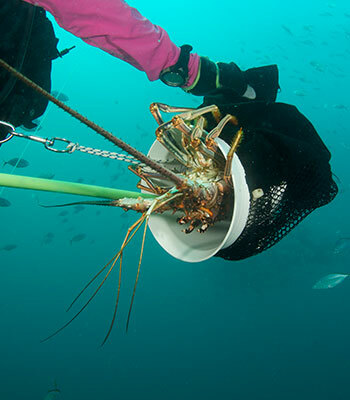 Mini season was designed for recreational harvest, which gave scuba divers a chance to catch some bugs before the commercial lobster traps get put in. This two-day event has become so popular that people take time off of work so they can splash at midnight to hunt. Many diving accidents have been associated with mini season in the past. Lots of boats and lots of divers after the same thing can make for mistakes. So here are some recommendations on how you can get ready for a successful mini season. Get your Florida Fishing License at MyFWC.com and add the spiny lobster permit to your license. Also your license must be with you, so make sure to keep it in a drybox on the boat. Take a Boater Safety Course, there are many options weather you want a classroom training or an online training, either will give you more knowledge about general boating skills. You can find an online class at this site or classroom training can be found at this site. There is currently one schedule for July 15, 2017 in Ft Lauderdale from 8:30 am to 5 pm, click here for more info. If it’s been awhile since your last dive, take a scuba refresher course. Force-E Scuba Centers offers 1 or 2-day courses to help you refresh the basics like proper gear set up and dive planning using a dive table or dive computer. They will also review good buoyancy skills so that when you are going after that lobster you are mindful of the reef below. Get your scuba equipment serviced. The best practice is to have your regulator and BCD serviced every year. Your scuba cylinders must have visual inspections every year and a hydro test every 5 years from a licensed scuba shop. Don’t wait until last minute to get your gear serviced because during this time, scuba shops are swamped and the turn around period is 7-10 days. Talk to your local scuba shop staff members about losbtering. They will know the best gear for the hunt, and they can offer tips and tricks. The green lobster loop is a fan favorite because its easy to use and reduces the damage to corals and the reef around the lobster hole. Don’t wait to book your dives! The dive charter boats will offer multiple charter times throughout the day to maximize the trips that divers are out lobstering on for mini season, but they will fill up fast but during this time. Get Dive Accident Insurance, companies like Divers Alert Network and DiveAssure offer affordable plans for divers in case accidents happen. Some of the most common mistakes divers make during mini season are running out of air, going into deco, equipment fail, lionfish stings or eel bites, buddy separation or boat separation…so don’t be one of these mistakes. The best lobstering experience is a safe and thoroughly prepared one! Get the most out of mini season and have fun. To ensure a safe and successful mini season you can hire one of our staff members, who have plenty of lobstering experience, as a guide so you can spend more energy on brining home dinner.